UAV airborne magnetic surveys. Modern Mag • Accurate, safe and reliable ground magnetic surveys. GEM systems sales. GEM systems UAV for magnetic surveys. Get in line people. I have fielded one call/email per week for about two years from people wanting to strap a magnetometer to their toy plane. At this point I may sound a bit tired and not as scientific as I should be, but please understand I take a lot of these calls and have seen it all before. Alas I will put my cynicism aside momentarily and explain what resources are required to get your UAV with a magnetometer in the air. It can be done…at a price. The geophysicist is the most important since they can tell you how to reduce the magnetic noise from the UAV using certain materials and compensation systems. If your data is too noisy, you will not be able to sell it, nor detect what you are looking for. The aeronautics engineer is the least important since many of the UAV’s are off the shelf and ready to go. The flight systems and software are mature. You will only need them when you need to change out some stock parts that are causing magnetic noise at the sensor. You could save costs by getting an electronics engineer or geophysicist who can write computer code. My estimate is that the people will cost ~$200k. Less perhaps if one of these people is a founder and you give up some equity. If purchased ad-hoc, the geophysical equipment will cost around $65,000 for a single sensor platform. This does not include a base station magnetometer or spares for when you crash. And you will crash. Everybody does. It is the reason that Universal Wing and Fugro Airborne surveys failed at great cost to develop UAVs for the airborne magnetic survey market. I was the first to use the Fugro GeoRanger system for a commercial survey in Canada. It was very impressive. But alas they crashed too many, and the business model failed. I don’t know how much your UAV cost. A couple of grand? Ten grand max? Choosing the right UAV in order to reduce magnetic noise is probably the most important step in your venture. Unfortunately, most people contact me with a UAV in hand made of all the wrong parts to provide clean magnetic data. I am not just talking materials science here. There a many strategies to reduce magnetic noise, such as engine type, electronics shielding, UAV configuration (push/pull etc), sensor location etc. The way you should choose a UAV is a follows: You buy two GSMP-35 magnetometers (you need these for your business anyway) and take them to a UAV show and test the magnetic noise of dozens of UAVs powered on and off and with different orientations. You will probably need a geophysicist with you for this process. Then you conduct further ground trials on the best candidates and choose one to start your 6-12 months R&D development phase. So at this stage you have spent $275k and will be ready to conduct your UAV airborne magnetic survey in 6-12 months. Or you can just buy the new GEMS systems UAV for $125k in about 3 months’ time. They have done all this work for you. Off the shelf and ready to go. The system has TWO GSMP-35s potassium magnetometers. Gradiometer systems have a distinct and saleable advantage over single sensor systems. GEM has gotten the payload down to 3.6kg and obtains a compensated magnetic signal with a noise level of only 20pT per flight. 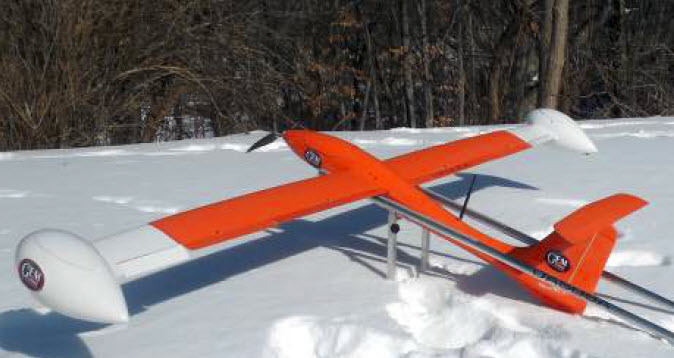 They are using a proven UAV chosen for its reliability and low magnetic noise. Initial testing indicates the geophysical sensors can survive a crash, though this can never be guaranteed, since there is always the possibility that the UAV could fall nose first from great height. GEM are experts in magnetic survey systems. It has taken them years and a team of engineers to develop a UAV for magnetic surveys. Do you really think you can do it for less than $125k for a gradiometer system? Contact Modern Mag for more information, advice, special pricing and preorders of the system. 1 – How do you maintain PARALLEL-to-the-ground flights? 2 – Is airborne Mag useful for low magnitude targets, given the UNAVOIDABLE FACT that the signal drops off to the POWER of 3 with increasing distance from the sensor?! How can a UVA-based Mag survey overcome this inherent signal loss compared to the closer (to target) ground-based surveys? Terrain following can be achieved with laser altimeters. Modern Mag and GEM Systems use lasers on our UAVs. A ground based survey will always give better signal to noise ratio and better data. Particularly if Potassium sensors are used. However it is the role of a geophysicist to determine if targets can be detected from both the ground and the air, and at what distance. This is usually done with sophisticated (and expensive) software and is called synthetic modelling.